Microsoft created Windows 8 with tablets in mind, but PC manufacturers haven’t shown exactly what real, purchasable Windows tablets will look like until now. 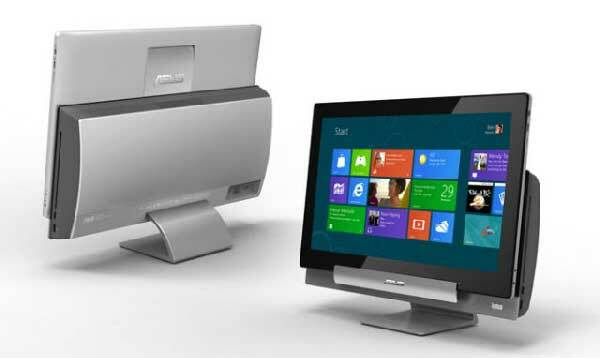 Both Acer and Asus unveiled the first round of Windows 8 tablets at the Computex trade show on Monday in Taiwan. And by doing so, they’ve begun defining a new category: The transforming tablet, which sits in a dock for everyday “computing” with a mouse and keyboard, but pops out for kicking back with the touchscreen experience. The show-stealer has to be the Asus Transformer AiO (shown above), an all-in-one desktop machine whose monitor is detachable, spawning a gargantuan 18.4-inch tablet. That rivals even the 17-inch Windows tablet that an intrepid young inventor was trying to build via Kickstarter. Besides being the largest Windows 8 tablet, it’s also the largest Android one, since it can dual-boot both operating systems. The LED-backlit display supports 10-finger multitouch. There’s no info on pricing or availability, but this is most definitely a machine running fully Windows 8 and not Windows RT, the OS for lower-power devices based on ARM-architecture chips. In that category, Asus has something else: the Tablet 600 — also a transforming device, — a 10.1-inch laptop when it’s docked with its keyboard/touchpad, and a Windows 8 tablet closer to the iPad in size when it’ not. It’s powered by an Nvidia Tegra 3 quad-core processor, has 2GB of RAM and includes a radio for NFC (near-field communication). The LCD’s resolution is 1,366 x 768, though it uses Super IPS+ tech, said to improve sharpness. The Windows RT tablet is due to arrive early in 2013. A notch up from the Tablet 600 is the Tablet 810, an Intel Atom-powered hybrid, with an 11.6-inch display. The screen is also an 1,366 x 768 Super IPS+ dipslay with 10-finger multitouch, plus it has an 8-megapixel camera with LED flash in the rear along with a 2MP camera in front. It has 2GB of RAM and 64GB of storage. Then there’s the Asus Transformer Book line, transforming Windows 8 tablets available in 11.6-, 13-, or 14-inch screen sizes. These are full-on laptops when docked as they’re powered by Intel’s latest Core processors, a.k.a. Ivy Bridge, along with discrete graphics. The displays are full HD (1,920 x 1,080), and they boast 4GB of RAM, either solid-state or hard-disk storage and 5-megapixel rear cameras. Not to be left out, Acer had a couple of transforming tablets as well. The Acer Iconia W700 and W510 both pop out of keyboard docks, morphing from laptops into Windows 8 tablets. While the W700 is clearly a full Windows tablet, the 510 appears to be powered by Windows RT. The W700 has a full HD display, three USB 3.0 ports, an HDMI jack and a Thunderbolt port. It also has a 5MP camera in back and a front-facing camera as well. The tablet connects to the dock via Bluetooth, oddly, as opposed to a hardwire connection. The Iconia 510, however, does connect to its keyboard through the dock, and the dock is rated to extend the tablet’s battery life by 18 hours. It’s most interesting feature is its ability to rotate in the dock 295 degrees — not quite the full 360 degrees of Lenovo’s IdeaPad Yoga, but convenient for watching a video in an airplane seat. It includes slots for a SIM card and microSD as well as ports for micro USB and HDMI.